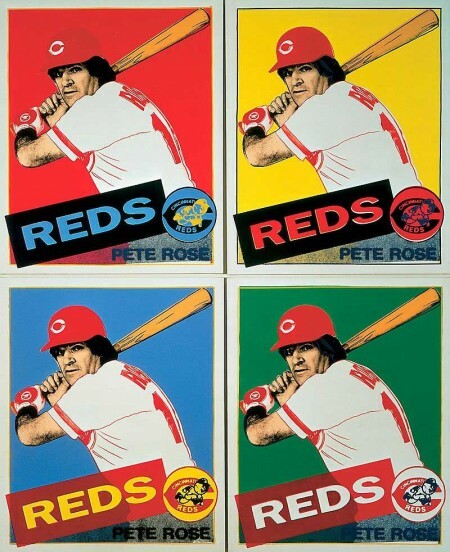 Andy Warhol didn’t know who Pete Rose was, and Rose didn’t know who Warhol was. They never met. Warhol chose the photo on which he based his now Cincinnati-famous screen-print from a selection of newspaper shots sent to him, because Rose couldn’t (or maybe wouldn’t) make it to New York City to pose for a Polaroid. When Warhol heard that Rose was a “switch hitter,” he giggled. Nothing better than a Warhol giggle. The show up at the Cincinnati Art Museum, “Up at Bat: Warhol and Baseball” (running through August 2, 2015) paying homage to the screen-printed images of Rose (and two other baseball players) Warhol created, is a giggly, kind of ironic, super-simplified commemoration of both Rose as a superstar and Warhol as a super-fan. But true to Warholian form its beautifully bubble-gum-vacuous veneer has a see-through quality, a gaze as glaze. Staring at the Warhol’s prepackaged image of Rose, you start to think about it all, about Rose the genius (when the piece was commissioned by the Cincinnati Art Museum in 1985 Rose was about to make his record-breaking hit), Rose the gambler, Rose the shunned, and more specifically Rose the unglamorous, unknowing specimen transformed into Pop Art emperor, all of that festooned in the exaggerated enthusiasm of a simple little baseball-card. In short, Warhol’s deification of Rose spotlights Rose for everything he was and is, and even though Warhol “honors” Rose with a primary-colored Americana swagger, there’s still that feeling of trickery and betrayal and loss, no matter how you festoon it. Maybe Warhol’s genius at the end of the day is serendipity, just the pure nonsensical joy of turning celebrities and athletes and politicians into artificial Christmas trees we want to see pushed down some stairs. His fan worship has an undercurrent to it (think of those gigantic Mao flags he did, or the lush almost amnesiac gold lamé of his Marilyn series); he makes fun without anyone knowing – that silvery giggle layering each surface. In fact, Warhol portraits, like the one of Rose in the show, are now kitschy symbols of conspicuous superstardom, Warhol kind of selling his soul to celebrities who don’t have souls. Remember the big dustup a few years back, when Ryan O’Neal was sued for hogging the portrait of Farrah Fawcett Warhol did? Or the portraits of Michael Jackson, OJ Simpson, Liza Minnelli, and so on? All of those Day-Glo masterpieces are haunted by narratives far beyond the scope of Warhol’s gaze. When you look at them all you think about is the gossip and sordid situations behind the gloss and hue. They are formulated to draw attention to their Polaroid grandeur, their slapdash yet carefully executed style, so grimly decorative they become gorgeous jokes on the people being deified. “Fame” is given a drag-queen makeover to the point the whole thing reads like both a joke on fandom and fandom itself. That’s Warhol’s vision: worship as innocent grade-school vandalism, yet also as ephemeral and decadent as a mirror in a disco. So what’s all this got to do with Charlie Hustle? A lot. “Up at Bat” does not contend with any of this Warhol baggage in its context or wall text. Focused on the idea of Warhol as Great American Portraitist, it whitewashes his status as social observer and satirist and just plain All-American Weirdo. Subtitling the gig “Warhol and Baseball” elicits giggles of course, because the only thing that seemed to interest Warhol about baseball were commissions to do baseball-player portraits and his unending desire to capture the essence of American culture and reduce it down to a sort of plastic extract that shows you both its worthlessness and its ongoing necessity, even its spirituality in a way. 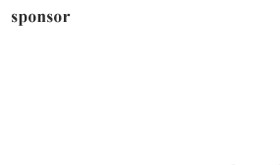 And that’s Pete Rose, too, in a nutshell: he’s both joke and wonder. That status as baseball royalty and baseball crook, and the nostalgia built into Warhol’s approach (framing that stardom in jubilant baseball-card camp), solidifies into a narrative close to pop-culture destiny. His downfall is always ongoing, and yet just last week Rose signed a contract to be commentator on Fox Sports. God Bless the USA.